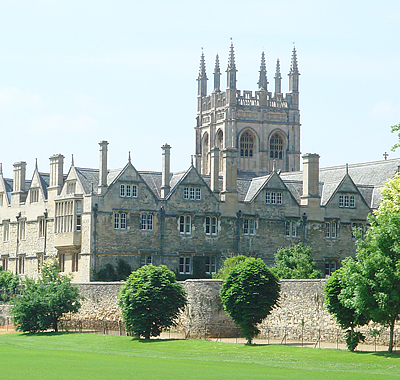 Click for more news from or about Oxford. See also Books about Oxford, England. Fascinating new information about the possible evolution of birds has been revealed recently by scientists from Oxford University (England, UK). According to the recent study, details of which has been published in Proceedings of the Royal Society B, radical shortening of the bony tails of the earliest birds over 100 million years ago enabled them to develop versatile legs that gave them an evolutionary advantage. 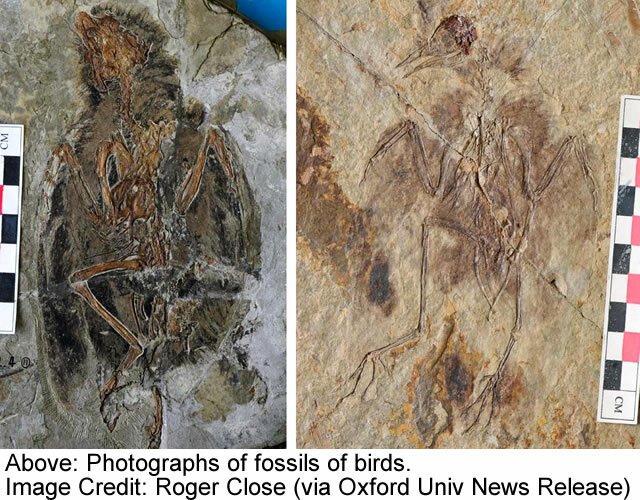 A team led by Oxford University scientists examined fossils of the earliest birds from the Cretaceous Period, 145-66 million years ago, when early birds, such as Confuciusornis, Eoenantiornis, and Hongshanornis, lived alongside dinosaurs. At this time birds had already evolved powered flight, hence changes to their forelimbs. The research team investigated how this new lifestyle related to changes in their hind limbs (legs). They made detailed measurements of early bird fossils from all over the world including China, North America, and South America. Analysis of the data indicated that the loss of their long bony tails, which occurred after flight had evolved, led to a huge increase in the diversity among the hind limbs of early birds, prefiguring the amazing variety of talons, stilts, and other specialised hind limbs that have helped to make modern birds so successful.
" These early birds were not as sophisticated as the birds we know today ? if modern birds have evolved to be like stealth bombers then these were more like biplanes," said Dr Roger Benson of Oxford University's Department of Earth Sciences, who led the research.
" Yet what surprised us was that despite some still having primitive traits, such as teeth, these early birds display an incredibly diverse array of versatile legs." By comparing measurements of the main parts of the legs of early birds ? upper leg, shin, and foot ? to those of their dinosaur relatives Dr Benson and co-author Dr Jonah Choiniere of Witwatersrand University, South Africa, were able to determine whether bird leg evolution was exceptional compared with the evolution of legs in dinosaurs.
" Our work shows that, whilst they may have started off as just another type of dinosaur, birds quickly made a rather special evolutionary breakthrough that gave them abilities and advantages that their dinosaur cousins didn't have," said Dr Bensons.
" Key to this special 'birdness' was losing the long bony dinosaur tail ? as soon as this happened it freed up their legs to evolve to become highly versatile and adaptable tools that opened up new ecological niches." It was developing these highly versatile legs, rather than powered flight, that lead to the evolutionary diversification of early birds happening faster than was generally true of other dinosaurs. See also information about common fossils, human evolution and the hominid evolutionary tree. News is included on the IvyRose website to inform visitors about current health and related science topics, but not to endorse any particular view or activity. Any views expressed in the article above are not necessarily those of IvyRose Ltd.. Material in this news item was released by the source listed below on 14 August 2013 and may have been edited (e.g. in style, length, and/or for ease of understanding by our international readers) for inclusion here.